That's a wrap! Director Martin Scorsese has been hard at work on The Irishman, a passion project for him that has been brewing for quite some time but is finally on its way to becoming a reality. 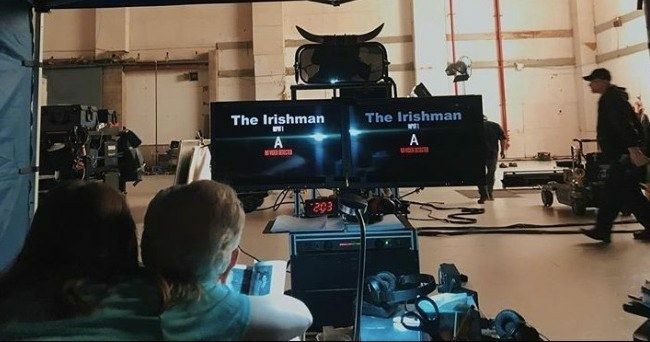 Netflix stepped in and put up the money that no other traditional studio in Hollywood was willing to put up in order to make The Irishman happen. Will all of that money and time spent waiting to get this movie made be worth it? We're one step closer to finding out as filming on the movie has officially concluded. Martin Scorsese took to Instagram to make the announcement that The Irishman has wrapped. This project is accomplishing a lot, bringing together Al Pacino, Robert De Niro and Joe Pesci for the first time ever. Pesci had retired from acting, but was persuaded to come back for this movie, which took quite a bit of convincing. "That's a wrap! Thank you to the many people who made this possible. #iheardyoupainthouses #theirishman." Netflix is said to be putting up more than $100 million to make The Irishman. The budget has reportedly ballooned during the filming process and is now said to possibly be Martin Scorsese's most expensive movie to date. Much of that has to do with the fact that the movie, which is based on Charles Brandt's novel, I Heard You Paint Houses, will take place during two different time periods. To accomplish this, Scorsese will use de-aging technology, which has been seen in movies like The Curious Case of Benjamin Button, in order to make Robert De Niro, Al Pacino and Joe Pesci look like younger versions of themselves. That's going to come at a cost and will take a lot of time to get done. While no official synopsis has been released for the movie yet, here's the synopsis for Brandt's novel, which gives us an idea of what we can expect with The Irishman. "The first words Jimmy Hoffa ever spoke to Frank 'the Irishman' Sheeran were, 'I heard you paint houses.' To paint a house is to kill a man. The paint is the blood that splatters on the walls and floors. In the course of nearly five years of recorded interviews Frank Sheeran confessed to Charles Brandt that he handled more than twenty-five hits for the mob, and for his friend Hoffa. Sheeran learned to kill in the U.S. Army, where he saw an astonishing 411 days of active combat duty in Italy during World War II. After returning home he became a hustler and hit man, working for legendary crime boss Russell Bufalino. Eventually he would rise to a position of such prominence that in a RICO suit then-U.S. Attorney Rudy Giuliani would name him as one of only two non-Italians on a list of 26 top mob figures. When Bufalino ordered Sheeran to kill Hoffa, he did the deed, knowing that if he had refused he would have been killed himself. Sheeran's important and fascinating story includes new information on other famous murders including those of Joey Gallo and JFK, and provides rare insight to a chapter in American history. Charles Brandt has written a page-turner that has become a true crime classic." Netflix has yet to settle on a release date for The Irishman, but it's likely going to be seen as an awards season contender. So we might expect to see it arrive, at least in limited release, later this year. Currently, the movie is listed for release in 2019. Netflix doesn't typically do much in the way of a theatrical release and, while there's been some debate as to whether or not The Irishman will actually be seen in theaters, Scorsese reportedly insisted on it when signing his deal with the streaming service. Even though filming has wrapped, it's going to take a long time to get the de-aging effects finished. Plus, the movie has to be edited. You can check out Martin Scorsese's Instagram post for yourself below.